It’s not too often that a referee is thrust into the public spotlight. After all, it’s their job to be in the background and moderate games so they are played fairly. Nobody ever pays to see the refs work. But when they do receive attention, damn is it negative. 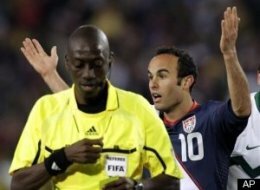 Referee Koman Coulibaly turns his back to Landon Donovan, and his career. Last Friday, Malian referee Koman Coulibaly found this out for himself as he muffed the biggest call of his life in the U.S. 2-2 tie with Slovenia during pool play of the World Cup. For anybody under a rock who may have missed the play, U.S. sub Maurice Edu poked the ball ahead of the Slovenian goalie off a free kick by Landon Donovan in the 86th minute. But Coulibaly disallowed the potential game-winning goal by calling a foul on the U.S. for ……., well, we don’t really know. Nobody does. Donovan and the rest of the world with him. If anything, a foul should have been called on a Slovenian defender for holding (bear hugging, actually) U.S. striker Michael Bradley. Now, multiple reports say that FIFA may drop Coulibaly for the remainder of the World Cup. They won’t say what the call was, and neither will Coulibaly for that matter, but it is pretty clear he’s not wanted around international soccer any more. He’s become a disgrace and it’s a safe bet that the next time he runs on to a pitch, everyone there – players, coaches, fans, and announcers – will be quick to remind him of his mistake. His career, in essence, is ruined. Look, I know everybody is human, referees most of all. They make mistakes. It happens and people move on. But what Coulibaly did is indefensible. It doesn’t matter that he called a foul on the wrong team, or that it probably would’ve won the game for the U.S. What matters is that he didn’t admit his mistake and, even worse, refused to discuss it. This whole incident reminds me of the Jim Joyce fiasco when the seasoned umpire made an erroneous safe call that took away Armando Galarraga’s perfect game. Yet, unlike Coulibaly, Joyce admitted that he was wrong after the game and publicly apologized to Galarraga. Although I’m sure a few Tigers fans still despise Joyce (and probably always will), the vast majority of baseball has since forgiven him. He was even recently named baseball’s best ump by an overwhelming majority, according to a survey by players. Now I know that FIFA operates a bit differently from governing bodies for other sports like MLB or the NFL. According to the U.S. spokesman, there is no appeal process for bad calls like the option to challenge in football. FIFA does require all referees to submit a written report after each match, but there is no formal process to correct a mistake during the game. Coulibaly could’ve told any of a number of furious American players and coaches what the call was. He could’ve admitted he made a mistake and that there was no foul. He could’ve even publicly requested that he be surrendered of officiating duties for the remainder of the World Cup. Any of these things would’ve shown him to be a referee of strong character with a sense of integrity for the game. He did none of them. PR Rule #1: Always be honest. Joyce knows it. Coulibaly apparently never learned it, and now he’ll have to pay for it. This entry was posted in Image Management and tagged FIFA, Jim Joyce, Koman Coulibaly, Landon Donovan, soccer, World Cup. Bookmark the permalink.